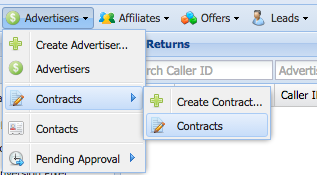 Click on the Contract Name to open the Contract (Make sure it's a Call Routing Contract). Hourly Transfers: How many calls can be transferred in an hour. Daily Transfers: How many calls can be transferred in a Day. Weekly Transfers: How many calls can be transferred in a Week. Monthly Transfers: How many calls can be transferred in a Month. Hourly Billable Transfers: How many Billable calls can be transferred in an hour. Daily Billable Transfers: How many Billable calls can be transferred in a Day. 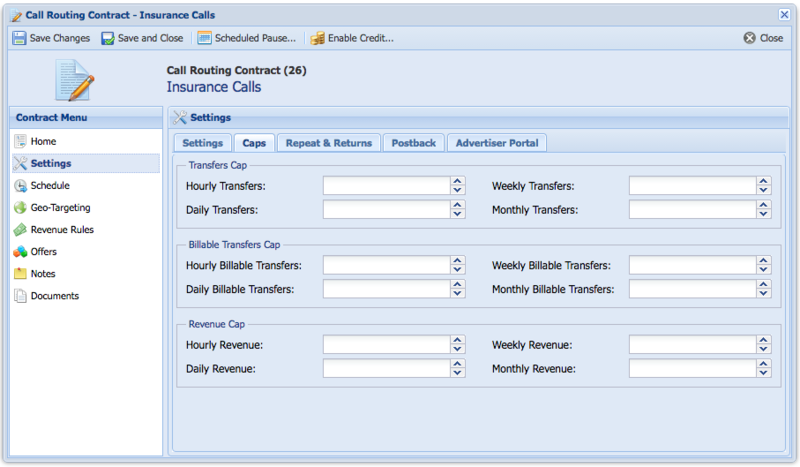 Weekly Billable Transfers: How many Billable calls can be transferred in a Week. Monthly Billable Transfers: How many Billable calls can be transferred in a Month. Hourly Revenue: How much revenue can be generated within an Hour. Daily Revenue: How much revenue can be generated within a Day. Weekly Revenue: How much revenue can be generated within a Week. Monthly Revenue: How much revenue can be generated within a Month.